My traveling companion is a very nice man. He takes me on all of his business trips, to strange and exotic places. Even though he is quite busy on these trips, he always finds time to take me around to see some of the interesting sites in the city. He takes pictures on our travels, for me to put in my scrap book, and to email to my family. But he doesn’t take me with him everywhere when we are on these trips. Sometimes he goes out with his friends, and leaves me in the hotel room. I don’t mind this at all. We Bears are very solitary creatures, and need time to ourselves or we tend to get rather grumpy. One evening I was sitting in the hotel room by myself, thinking of all the amazing things that I had already seen, and wondering what new adventures lay in wait for me. I started going over each city in my mind, trying to remember every last detail, so that I would be able to tell my family, my bear friends, and of course my new grade 3 human friends, all about my adventures when I saw them again. I began to worry that it would be impossible to remember everything. After all, bears like me don’t have big brains like you humans do. Then I had a brilliant idea. 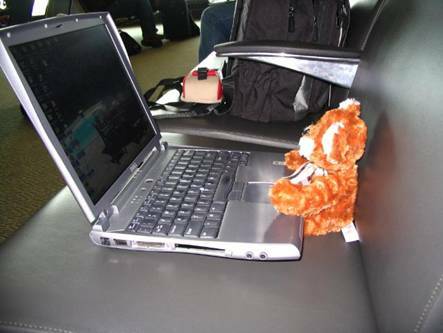 Earlier that day, my traveling companion had been showing me his computer, and telling me how you could use it to write stories. I suddenly realized that I could use the computer to write down everything about my adventures. I thought I was the first one to ever think of this, but I have since learned that many humans used to do this, and that it is called a diary. I still like to think that I am the first bear to have ever thought of the idea. In any case, that night I began writing down my adventures, and adding in pictures, so that I could tell my friends about everything I have seen. This happened in Washington. Before meeting my traveling companion, I had never been to America, and here I was on my second trip there in a month. I was excited about that, but I was even more excited to be visiting Washington DC, the capital of the United States of America. The fact that my new grade 3 friends lived near the capital of Canada, made it even more special. Everything I had read said that Washington was a very impressive city. Washington is filled with monuments. Some of the most impressive monuments are to honour presidents. One of my favourites was the Washington monument. I don’t really care about things like how tall it is, or how many stones there are in it. You can look that up for me if you want to. I am interested in more unusual things. Take a close look at this picture. Notice how the bottom stones almost look white, and then, about where my scarf is, the colour changes to look more like sand. You can almost see a line where it changes. Doesn’t that look strange? Have you ever wondered what could make that happen? Well, I wondered too, so I investigated, and found out exactly what caused it. Would you believe that they did not build the monument all at once? They started to build it and then stopped for over 20 years. When they decided to start building again, they couldn’t find the exact same type of stone. That is why the stone looks different – because it is different. 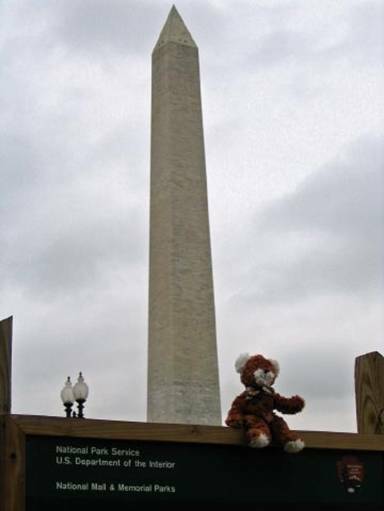 The Washington Monument is one of my favourites, but there are many other impressive things to see. And the best part is that they are all within walking distance – even for someone with legs as short as mine. So that is exactly what I did. 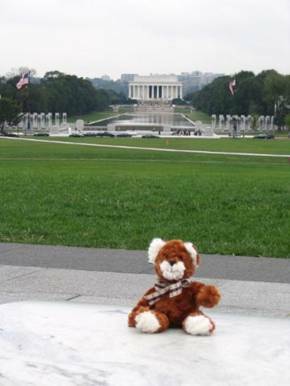 While my traveling companion spent the entire day in a very boring meeting, I walked around Washington. After seeing the Washington Monument, I walked down to the Lincoln Memorial, dedicated to Abraham Lincoln. I also saw memorials to Thomas Jefferson and Franklin Delano Roosevelt. They were both presidents of the United States of America too. I had such a great time that I can hardly wait to go back again. I am sure you know that Washington isn’t just a city of monuments for tourists, like me, to see. It is also where the American government is. Because I am a Bear, I am very concerned about things like pollution. 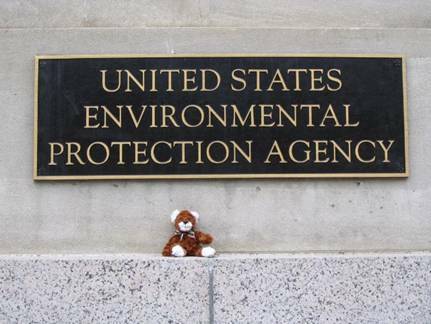 So when I was in Washington, I simply had to visit an organization with the same concerns – the Environmental Protection Agency. It seems obvious to me that protecting the environment is a very good idea. Don’t you agree?